A turbine flow meter is a volume sensing device. As liquid or gas passes through the turbine housing, it causes the freely suspended turbine blades to rotate. The velocity of the turbine rotor is directly proportional to the velocity of the fluid passing through the flow meter. The external pickoff mounted on the body of the flow meter, senses each rotor blade passing, causing the sensor to generate a frequency output. The frequency is directly proportional to the volume of the liquid or gas. Either a magnetic or modulated carrier (RF) pickup can be used to sense the rotational speed of the turbine rotor. If you need volumetric total flow and/or flow rate measurement, a turbine flow meter is the ideal device. 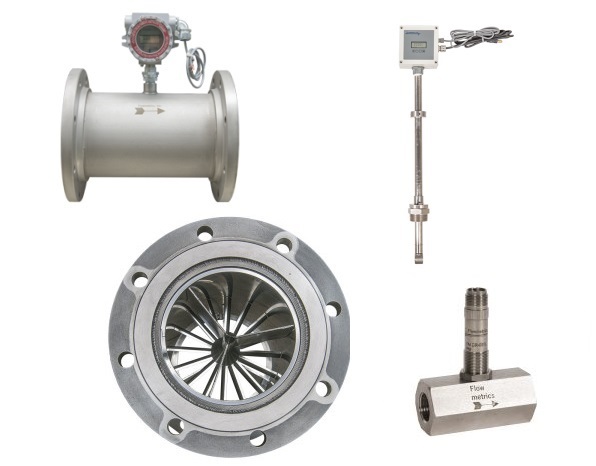 Turbine flow meters are used in a wide variety of liquid and gas flow sensing applications. They can be built to endure high pressure, and high and low temperatures. They offer a high turn-down with minimum uncertainty and excellent repeatability. Turbine flowmeters are also simple to install and maintain only requiring periodic recalibration and service. Accuracy is generally expressed as a percentage of true volume, measuring how close the instrument indicates actual flow. Repeatability is determined on how well the flow meter can indicate the same reading whenever the same flow conditions exist. It also ensures quality measurement of fluids over a wide range of flow rates, temperatures, compositions and viscosities. Depending on the type of turbine flow meter, the specifications vary. Tangential Turbine Flowmeter – (FMT Series) capable of measuring extremely low flow rates. Why Must You Maintain Flow Meter Accuracy? In the fight for achieving maximum efficiency, businesses in every sector of the commercial world view energy savings as a key part in this battle.